You’ve decided to take advantage of a phone charging kiosk for your business or event, so make sure you’re getting the most out of it with these 6 branding tips. The main purpose of retail signage is to communicate with customers, so be sure to not lose sight of that goal. Keep the messaging clear and think like a customer to make sure everything on the charging kiosk is understandable. Is the charging kiosk in a prominent enough place to be seen? Besides that, make sure the message makes sense for the placement. Instructions for how to use the kiosk are probably helpful on the front. The sides could be useful for directing customers around the venue or event space. Take into account all angles. Many kiosks come with display screens that are capable of providing digital signage. This could be valuable because then you might be able to deliver multiple different message with a slideshow of changing screens. Also, since the screens can be updated as needed, you can consider utilizing time sensitive messaging or changing them daily or weekly. Your brand should have a developed look and feel that includes a logo, colors, and messaging tone at a minimum. Make sure that comes through when you design a wrapper for the charging kiosk. It’s important to make sure your business looks unique from competitors and recognizable to customers. A charging kiosk is a high-tech, premium benefit customers love. Branding it is a valuable tool as we’ve discussed, but it’s also important not to diminish the value of it. Make sure the sign is clear and there aren’t any typos. If you’re using a wrap for the kiosk, make sure it’s a high quality material that sticks without falling off. If you own the kiosk, it’s important to think about durability as well. The goal is for the kiosk to attract eyes for the right reasons. The first 5 tips have been focused on making your brand shine on the charging kiosk, but there might be times where it makes sense to showcase a sponsor as well. If you have a partner who is paying to provide the kiosk then it’s one less cost you have to worry about. Veloxity offers three different charging solutions that each have unique branding opportunities for your business or event. 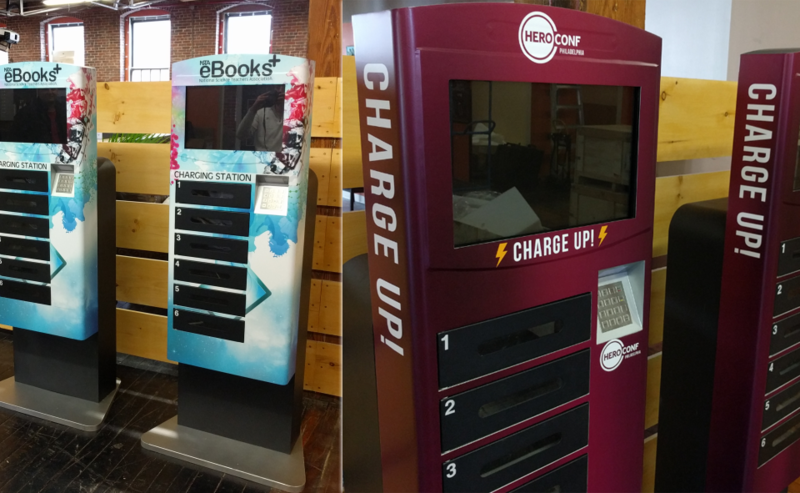 Contact us today about purchasing or renting phone charging kiosks and portable charging stations.